The Centre for Exercise, Nutrition and Health Science at the University of Bristol and the NIHR Bristol Biomedical Research Centre ran a project to see if ebikes were a potential way for adults with Type 2 Diabetes to be more physically active. Eighteen adults from the Bristol area, aged between 44 and 70, were loaned an ebike along with a helmet, lock and panniers for around 20 weeks during the summer of 2016. They were allowed to use the ebike for any activities whether recreational, commuting or shopping. During the project e-cycling raised heart rates more than walking and is potentially a way for adults with Type 2 diabetes to get fitter which could be positive for their health. In addition, e-cycling became popular with the participants who found they enjoyed it more than they thought they would at the start – almost four-fifths of the participants bought their own ebike at the end of the project. The project offered support to the participants by providing insurance and making available a technician who attended to occasional issues with the ebikes. There were also training sessions at the start of the project and the option of group rides. This early, extra support was valuable to the participants and made a difference to their decision to take part, as well as their enjoyment whilst using the ebikes. Participants were interviewed as part of the project and described how they felt the ebikes had helped them to ride greater distances and up hills, of which there are many in Bristol! Hills being one of the things that had put them off cycling a conventional bicycle in the past. E-cycling also meant less perspiration and enabled taking part in cycling with friends and family members as well as travelling to destinations such as local shops. Overall, this project looking at the feasibility of ebikes for adults with Type 2 Diabetes was a success in supporting a group of adults to adopt a novel mode of transport and indicates that ebiking has the potential to be popular as well as improve fitness in adults. Cooper, A.R., Tibbitts, B., England, C., Procter, D., Searle, A., Sebire, S.J., Ranger, E. and Page, A.S., 2018. Potential of electric bicycles to improve the health of people with Type 2 diabetes: a feasibility study. Diabetic Medicine. 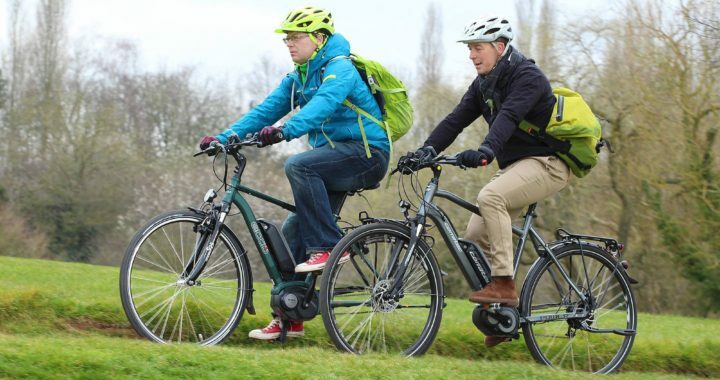 ← Case study: ebikes are the way forward! Case study: no need for our second car now! Case study: ebikes are the way forward! This is a Transition Bath project. The feasibility study is being run under a grant provided by the BWCE Community Fund.